Last week, whispers of an Al Gore presidential campaign began spreading, but were shut down before they could turn into serious buzz. After a source suggested to BuzzFeed that he was running, Gore's camp confirmed that the claim was false, saying that the former vice president will instead continue to focus on combating climate change. Which is exactly why Gore should return to the White House. Climate change is perhaps the most urgent issue of our time, not only for America, but for the future of the entire human race. For the sake of our children and grandchildren, Mr. Gore, maybe consider another run? 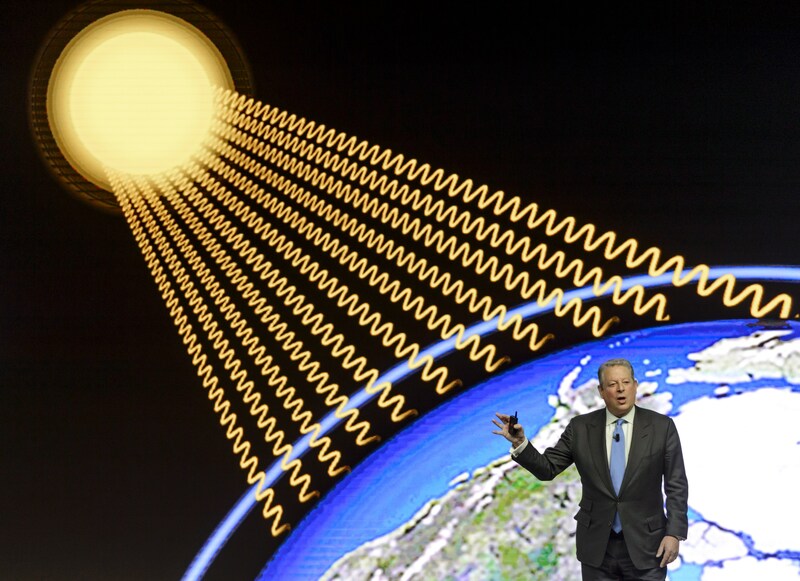 Gore has been devoted to environmental issues throughout his entire political career. In 1976, when he was a freshman congressman, he held the first congressional hearings on climate change. In 1992, when he was selected as President Clinton's running mate, Gore published his first book on environmental conservation, Earth in the Balance: Ecology and the Human Spirit. As vice president, Gore pushed environmental issues to the forefront, helping to enforce a carbon tax that reduced fossil fuel consumption, launching the educational Globe program, and pushing for the Kyoto Protocol, an international treaty that called for the reduction of greenhouse gas emissions. His career-defining moment came, however, in 2006, when his documentary film An Inconvenient Truth was released and introduced the severity of climate change to the masses. Not only was the film critically acclaimed (it won the Oscar for best documentary in 2007), it pushed climate change from the fringes into the national discourse. In 2007, Gore received the Nobel Peace Prize for his environmental work. Now, Gore is the chairman of The Climate Reality Project, a non-profit organization whose mission is to solve the climate crisis by creating and implementing practical solutions. With a career history like his, there's no shred of doubt that Gore would be the best president to spearhead sweeping changes in environmental policy, which is exactly what this country needs. In February, the Obama administration called climate change "an urgent and growing threat to our national security" in a national security strategy plan, along with international terrorism and weapons of mass destruction. The document lists the various effects that the environment has on the global community, including increased natural disasters, depleted resources like food and water, and infrastructure damage from rising sea levels. Similarly, last October, the Pentagon issued a similar report emphasizing the security threat that climate change poses. At the time, former Defense Secretary Chuck Hagel urged "politics or ideology must not get in the way of sound planning" when it comes to fighting climate change. However, it seems that no matter how many times the administration emphasizes and reemphasizes the effects of climate change and the dire need to confront them, politics is always getting in the way of enacting actual sweeping change in environmental policy. Climate change remains a strongly divisive issue for many politicians, including the current presidential candidates. While Hillary Clinton and Bernie Sanders acknowledge that climate change is real and must be addressed, a majority of the Republican hopefuls either avoid the issue altogether, claiming that the science is still inconclusive, or deem it a hoax that should not be prioritized. That is terrifying for a number of reasons. First, strong evidence of climate change is already manifesting before our eyes in very serious ways, from rapidly melting polar ice caps to widespread drought and an increase in wildfires — the latter two are affecting our own home turf in California. Secondly, if we don't face these natural effects head on now, they will worsen and reap irreparable damage on the earth. According to a University of Hawaii study from 2013, the earth could become uninhabitable in 45 years if we don't implement change now. Last, but certainly not least, this means that our children and their children will potentially live in a nightmarish world where breathing clean requires contraptions, the threat of natural disaster is constant, and basic essentials like food and water become limited luxuries. Given this very possible future scenario, candidates like Jeb Bush, who said, "I don’t think the science is clear of what percentage is man-made and what percentage is natural," and Scott Walker, who has largely avoided addressing the issue, might start to seem incredibly dangerous for your future progeny. That is why we need Gore to run again, if not for ourselves, then for our grandchildren.